Thanks to my parents, I’ve been on rivers since before I can remember. They cut out the storage hatch in my mom’s flatwater kayak and made a seat for me back before I was big enough to take up my own seat in a double. 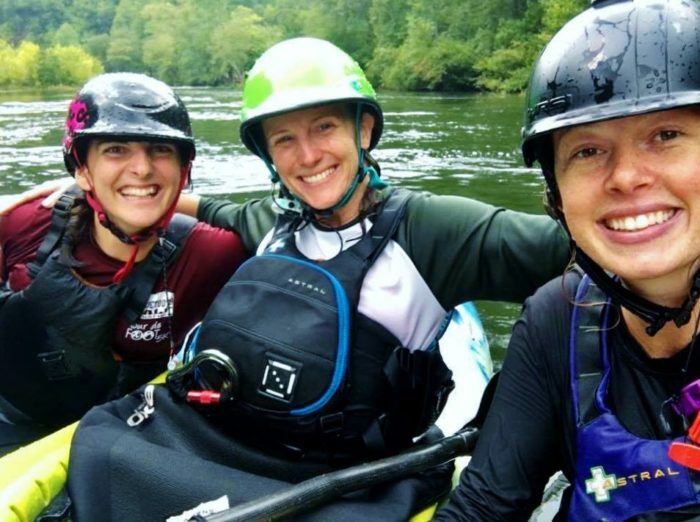 We saw manatees in Florida, paddled the south Georgia swamps, and got squirrelly taking those flatwater boats down the Class I-II Hiwassee River in Tennessee. But the river trips I remember most vividly are the rafting trips I took on the Ocoee with my dad. I LOVED the Ocoee’s big, splashy waves and the excitement of whitewater. When the guide asked if anyone wanted to “ride the bull” through Hell Hole, I practically jumped out of the raft trying to volunteer. As we made our way down the “Class IV, maybe even Class V” rapids (little did I know how much raft guides love to exaggerate), I was awed by the people in the tiny plastic kayaks – especially the guy with the paddles that were only scoops on his hands! The boats were so small, and the waves so big! They just roll them back over when they flip? Uh-uh. I was brave, but there was no way I would ever be able to do that. When I got to college in New Hampshire, I tried out whitewater kayaking a few times, but I didn’t really take to it, and confined my river experiences to exploring the beautiful flatwater stretches of the Connecticut River that bordered our campus. At the start of my senior year, however, I got recruited to help lead whitewater kayaking trips for incoming students. A bit odd for someone who had only been in a hardshell a handful of times, perhaps, but they had some skilled boaters in charge and just needed a couple more folks who could help out with logistics and handle their own on the Class I-II sections on which the trips would take place. As the trips neared, I looked forward to spending three weeks exploring northern New Hampshire and welcoming new students more so than I did spending all that time kayaking. But my co-leaders were excellent teachers to me as well as the newbies, and within a week I paddled my first Class III run, the Magalloway. The put-in was this terrible little eddy that could barely hold more than one of us and popped out straight into a half-mile of continuous Class III. Within seconds of trying to make my way down without flipping, all of those feelings of excitement from my trips on the Ocoee came rushing back. I was hooked. But there wasn’t a next time I was home, not during Ocoee season anyway. I graduated that spring and moved to a tiny town north of Santa Cruz, California, where my work schedule and my rural home made finding paddling friends impossible. After that, my parents moved away from north Georgia, and visits “home” were now to south Florida and coastal South Carolina. Work eventually led me to the paddling mecca of Asheville, North Carolina, but I promptly broke my collarbone just as I was ready to get back into paddling. I found friends who liked to hike and play frisbee instead, and once again found myself content with taking the occasional flatwater float trip. But us river people can never deny our true nature for long. Last year, I lucked my way into an invitation on a private Grand Canyon rafting trip. We brought some kayaks to play around in, and our first day on the Colorado was my first day in a hardshell in over two years. I swam in the first rapid, lost both of my contacts, and cried once I got back on shore. I dug new contacts out of my dry bag that night and got back in a kayak the next day. I loved every second of it. I came home and started pestering the few paddlers I knew to take me with them. I went to women’s paddling meet-ups and rebuilt my skills. I met a woman named Terra who lived near the Ocoee and offered to take me down when I felt ready. Later that summer, I called her up and drove to Cleveland. Getting into my boat below the dam as hordes of rafters lined up above us felt surreal. I had spent the whole summer building confidence on Class III on the rivers near Asheville, but this was different. This was something I thought I would never be able to do. More than fifteen years after I fell in love with the Ocoee, I finally had the opportunity to fall in love with it in a whole new way. And that’s exactly what I proceeded to do. I eddy-hopped through Grumpy. I flipped at the first drop of Broken Nose, exactly where Terra told me I didn’t want to flip. I got a clutch roll just above the second drop of Broken Nose, which resulted in my friend Ellen and I styling the rest of the rapid together as we tried not to crash into each other. I surfed Hell Hole. I grinned and giggled my way down the river. And when we drove back into cell range, I called my dad.